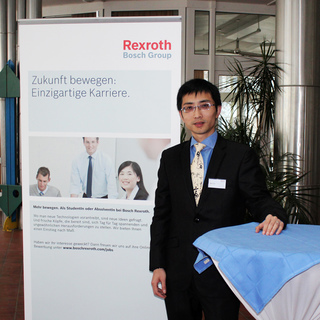 Bosch Rexroth China as a management trainee. 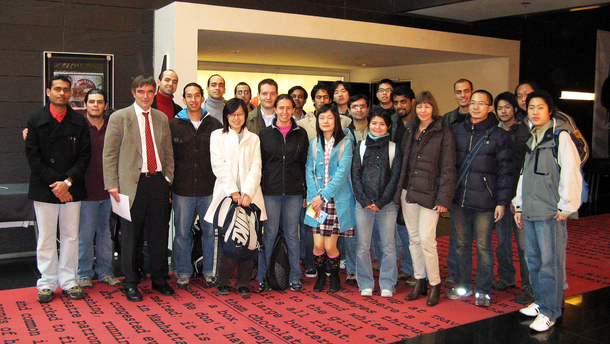 I continued my academic pursue as a Ph.D student at the Fraunhofer Institute (IPK) in Berlin, Germany. a managing position in the purchasing department at Bosch Rexroth. it would broaden my horizon, both academically and culturally. teaching me the importance of persistence and integrity. of the special intercultural variety that Berlin offers. It is a fantastic city to live in, especially as a student. try to do some part-time jobs, not for the money, but for the fun and the experiance you make during the work. Opportunities might be right around the corner, especially in Berlin. I’m currently within the “Junior Managers Program” of Bosch Rexroth focusing on Purchasing. 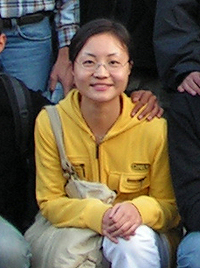 After getting my bachelor degree in Nanjing University in China, I took the opportunity to join the master program of “Global Production Engineering” in TU-Berlin, where an exciting and promising journey started. 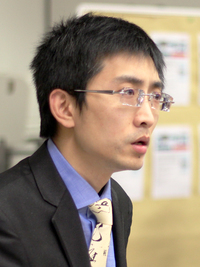 I was well prepared in both engineering and managing aspects during the program, and got my horizon broaden as well. I became a PHd. Candidate in Fraunhofer IPK after my master, during which time, the Bosch Rexroth and I found mutual fondness in a campus-recruitment, and then here I am, a proud member of the “JMP” community in BR. I started my first station in the Project Purchasing in Beijing plant. It’s quite a demanding job, which requires good communication skills and strong technical knowledge. Organization skills and multitasking are also a must. I found myself progressing every day. After six months, I went to the Project Purchasing in Horb plant in Germany, supporting localization and local-to-global projects. Germany is like my second home country, so I don’t have any culture difficulty. But the experience of working in the lead plant is still priceless, and will benefit me in the long run. I returned to Beijing plant for my third and current station, but in Purchasing Quality this time. Understanding the quality control gives me the insight, which I can use in the future, to solve problems before they even happen. I was welcomed into the BR family and immediately felt comfortable. Colleagues are open and helpful. My stage plan was set systematically and carefully by my mentor, who is a high level manager. He guides me all the way along, and gives me very useful suggestions to prepare me assuming the future management position. Within the big family, we have a smaller and even closer group, “Junior Management Program”. We are very well connected, sharing experience within different departments and business units. It puts us in perspective and will be beneficial for our future career. I will go to Logistic for my next and last stage of the JMP training, which has direct and close cooperation with the Project Purchasing. All my stages have the common purpose of preparing me for the future job in Project Purchasing, within which lies my interest. ALPS Electric Europe GmbH in Germany. I work at the quality department as a quality engineer. RLE international as a quality engineer. to have more responsibility in the department. the reasonable timing plan that the GPE program offers. teaching me to be to become a team player and to be open minded. The GPE studies also teach you to have an international scope by studying together with international students. the special variety of cultures that Berlin offers and also because of the comparatively low costs of living in Berlin. to enjoy life and take your time to experience the city and the broad program of opportunities it offers. it opened the door to the world for me! Siemens AG in Berlin as a project leader in the research & development department (medium voltage division). 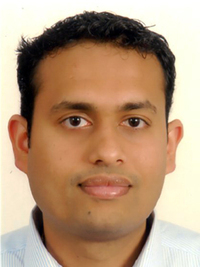 I started my GPE studies in 2006 and completed an internship at Siemens in 2007. Since 2008 I work as a regular employee for Siemens. Presently, I have an unlimited work contract with Siemens and a permanent residence VISA. I'm very much satisfied with my tasks and responsibilities at Siemens. Maybe, in future I will extend my supports from Berlin to guide R&D projects for Siemens Mumbai, India. the course content, flexibility and exposure to various disciplines in the GPE program. Besides the excellent teaching faculties and experienced teachers, it has a benefit to graduate from a world renowned university like the TU Berlin. In addition I received a full time scholarship from Siemens Germany for my master studies. opening gates to me and offering me a variety of international career opportunities. the multicultural attitude in Berlin and the sheer number of events and happenings each and every day. You can experience new things every day! Don't wait for opportunities but seek for it. most cherishing moments I had in my life! Unni Suresh (very left), Prof. Seliger (third from left).